Please pray for Greek Impact tonight at 8:48! And don’t forget to enter to win the Paper Sunday Giveaway! If you’ve been around this blog any length of time, I pray you’ve heard our heart to reach the world for Christ! We spend the best hours of our work week just doing that from our corner of the world here at the University of South Carolina…but it’s been really awesome to see ministry continuing on via our students when they graduate! Clothed in Hope was founded by my dear friend Amy Woodell, whom I met as a freshmen AXO and have had the privilege of seeing transformed by Christ in front of my very eyes. CIH was launched after she went to Zambia on a Summer Project and was forever changed by seeing God’s heart for the world. The people of Zambia stole her heart and in June, when she graduates, she will return to help bring the Good News of Jesus to Zambians! Her organization seeks to do this by “providing hope to widows of the Ng’ombe compound in Lusaka, Zambia through vocational training in sewing in an effort to alleviate poverty at the grassroots level. We believe hope means much more than financial assistance. By empowering widows through life-skills training, we want to play a role in renewing their confidence, impacting their culture, and inspiring women across the globe.” Pray for Amy as she seeks to glorify God in this venture. Program 21 was founded by my friend Becca. Remembering back to when she was a freshmen ADPi warms my heart as God has powerfully done a 180 in her life. God laid Uganda on Becca’s heart during her senior year and she took a step of faith and went on a Visiting Orphans trip to minister to the children for 10 days. She too was forever changed by God’s heart for the world and after graduation, moved to Uganda for 3 months to live and serve in an orphanage in a small rural town outside of Jinja, Uganda. 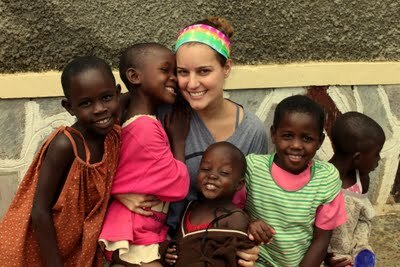 She has since returned and started Project 21 with hopes of nourishing both the bodies and souls of Ugandan children. Please pray for Becca as she continues to step out in faith and follow the Lord in this ministry. I am continually amazed how God takes loaves and fish and multiplies them to feed thousands. Please pray for these girls and for many others who have gone on to join staff with Crusade, enter the business world, teach, serve in their homes, neighborhoods and communities. We want to see 100% of our students sent into the Harvest to reach every segment of society for Christ!